But today we're talking about something else. I read an article recently from the November 2017 American Journal of Critical Care. It's called "Quiet the Mind: Mindfulness, Meditation, and the Search for Inner Peace." Sounds very mystical, right? While I'm not a crystals and astrology person (no judgement if you are! Do you! ), I am impressed with the amount of evidence based data that explains how the M&Ms (mindfulness and meditation) can help with your overall health! It can positively impact your stress, anxiety, depression, sleep, weight, and relationships and who wouldn't want that? 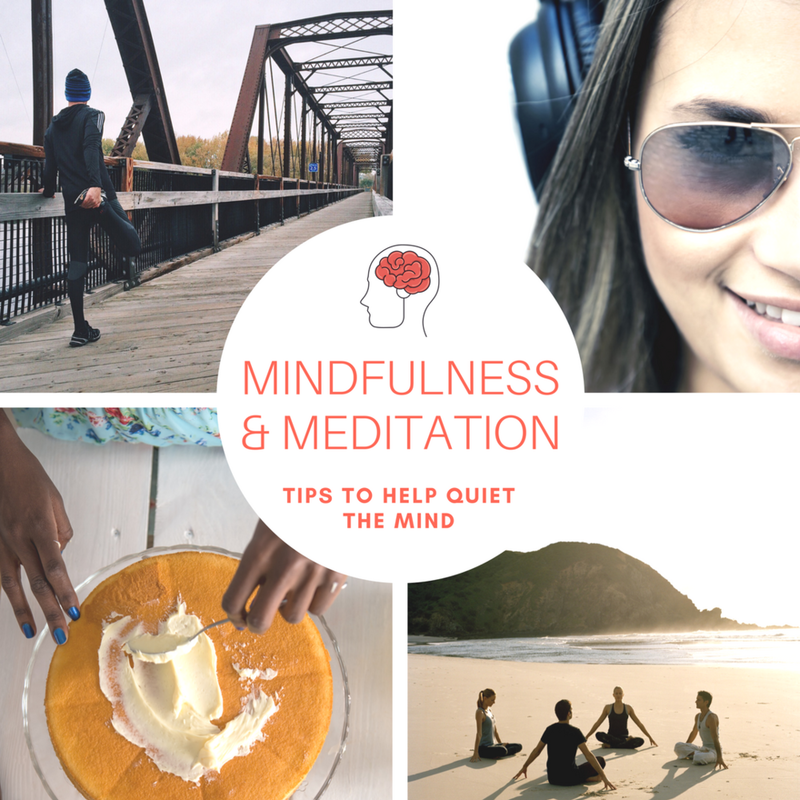 In the article, mindfulness is defined as paying attention on purpose, being present in the moment, and allowing an experience to unfold moment to moment in a nonjudgmental way. Easier said then done! Have you ever had a panic attack? The mind almost instinctually fixates on the things that make us anxious and stressed. Those emotions makes the mind race and there's an incredible amount of overwhelm to the point that the anxiety chokes us and makes it hard to breathe. At least, that's how I'd describe my experience. I'm sure it's slightly different for everyone. Breathe. When you're feeling anxious, especially if it's at panic attack level, one of the quickest and simplest things to do in the moment is to stop and focus on your breathing. Work on taking taking slow, deep breaths, filling up the bottom of the lungs first, then the top. Breathe in slowly over 5 seconds, then hold for 3, then slowly blow out through pursed lips. I find practicing this breathing while meditating can quiet my mind within a matter of minutes. Meditation. See below for more details on what works for me! Exercise. Get those endorphins! You guys, there are so many studies that show the connection between exercise and mental wellbeing! While my personal go-to is yoga, you can do any number of things: walking, running, biking, dancing, hiking, etc. Bonus points if you can get outside and get some vitamin D from the sun! Music. There is a fascinating connection between sound and memories/emotion! It's why you can hear a song that will mentally hurtle you back in time to when you were a socially awkward teenager trying to impress your latest crush. It's why Coldplay X&Y takes me back to the years I was dating Mo. You can read about my nurse friend, Brian, who intentionally decided to link music to different countries he's traveled to. How great would it be to create a Japan playlist on Spotify? So if you need to mentally change gears, play some music that makes you nostalgically happy! Frosting therapy. While I haven't found any evidence-based studies to back this one up, I can tell you that it works for me! Frost a cake. Or a cupcake. Or a cookie. Something about the repetitive nature of focusing on spreading an even layer of icing on a treat is just so soothing and therapeutic. It's a good excuse to start working on those Valentines cookies! Spend time with your pet. I find that my sweet pup can be such a helpful distraction! Just being in the moment with him and engaging in play can be wonderful. There's a reason pets are used as therapy animals! But, unfortunately, you still can't bring your emotional support peacock with you on a plane. This was the first app I downloaded on my phone to test out meditation. They have an amazing collection of nature scenes that you can enjoy on your phone so you can virtually go to your happy place and quiet your mind. My favorites are summer meadow, mountain lake, fireplace, thunderstorm, and tropical beach. But there are SO many to pick from, you're bound to find something that you find relaxing. Once you pick the setting, you can choose to listen to the sounds of nature or go through a guided meditation session while listening to a soothing female voice (Tamara Levitt, Head of Content at Calm). The free version will give you some basic guided meditation sessions but you can always subscribe and unlock all of them. FYI- Groupon has a deal for a year subscription for $39. But there are so many free options, it's worth it to download the app whether you purchase it or not. This app came highly recommended from friends and I was lucky enough to win a year subscription in an Instragram giveaway, so I'm currently in my first month of meditation with Headspace. You can listen to a male voice with a nice British accent (Co-founder of Headspace, Andy Puddicombe) talk you through a meditation session on whatever topic you choose. Again, the basics are free and you'll need a subscription to access the whole collection. I didn't notice any deals or discounts in a quick google search , but keep an eye out, I know I've heard them promoted on podcasts with a discount advertised and it looks like they've been on Groupon in the past. No matter what method you choose, I highly recommend taking 5 minutes each day to be still and quiet the mind. Just observe your thoughts from a distance instead of chasing and spinning them around in your head. It can lead to the happy, healthy life that you deserve!